Quentin Tarantino has one of the most eagerly awaited films of 2012 and most audiences won't get a first glimpse until Christmas, but that hasn't stopped speculation that it may be an Oscar contender and may be one of the Pulp Fiction filmmaker's best to date. Yet, Django Unchained may be the beginning of his filmmaking sunset, the director hinted. Speculation and excitement have been building among Quentin Tarantino fans for the Christmas-day release (in N. America) of Django Unchained, starring Leonardo DiCaprio, Samuel L. Jackson, Jonah Hill, Christoph Waltz and Kerry Washington. But for those Tarantino fans just jonesing for a Tarantino fix ahead of that roll out, Lionsgate and Miramax are teaming up on a massive Quentin Tarantino Blu-ray disc boxed set. 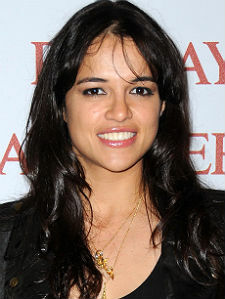 Michelle Rodriguez can do tough in her sleep, as evidenced in the upcoming alien war pic Battle: Los Angeles and, well, every other role she's ever done. But after building a career out of being Hollywood's go-to action chick, M. Rod's ready for a change of pace. She's penning a script, looking toward comedy, and embracing her inner geek... by taking us back to the good old days, when she used to hang out in basements playing Dungeons & Dragons while rolling on 'ludes.